I mentioned a few posts back that we had bought a house and were in process of getting a closing date. I don’t know if all of you have had similar experiences, but it has been one frustration after another. We are about ready to fire both our lawyer and the appraiser. Thankfully, the bank has been great, but it has taken much longer than we anticipated. We also feel the pressure of Christmas coming and want to be in our new house before Christmas. Crazy, I feel like I’m at a standstill on the packing front until we know for sure when we are moving because I don’t want to pack up things we need. So this week I’m trying to accomplish all of my Christmas shopping, wrapping, last minute Christmas baking and Christmas card mailings. So it’s a busy, but frustrating week because I’m a planner and just want to know what is going to happen when. 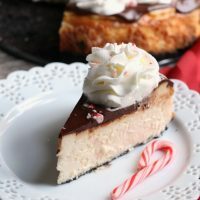 Thankfully, I still have a bit of this Chocolate Peppermint Cheesecake left over from last week and can eat away my feelings in rich Christmas flavors. Because, I sort of feel like we are being cheated this Christmas because we can’t decorate and participate in all our favorite traditions! But I am going to make Christmas cookies with a friend tonight and I’m excited about that. 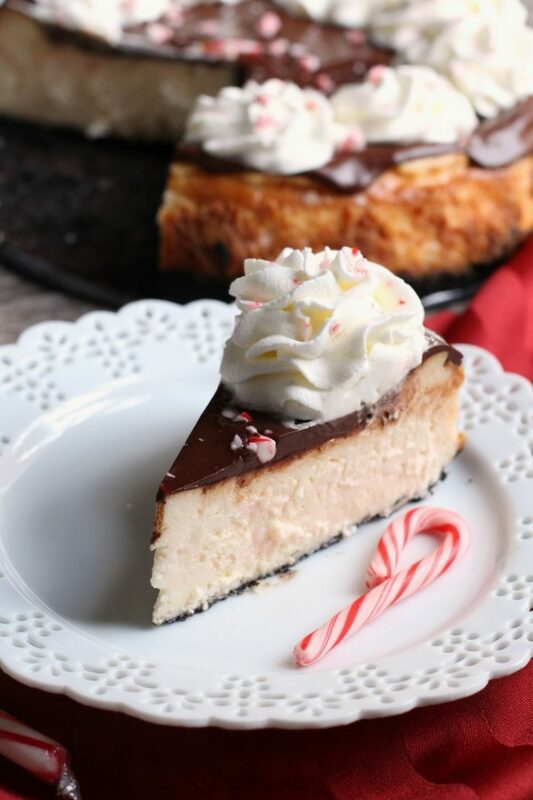 This Chocolate Peppermint Cheesecake is a fun, but easy dessert for your Christmas events. Sometimes making cheesecakes seem labor intensive, but the hands on time is a lot shorter than a typical layer cake. Just plan ahead for the long bake time. 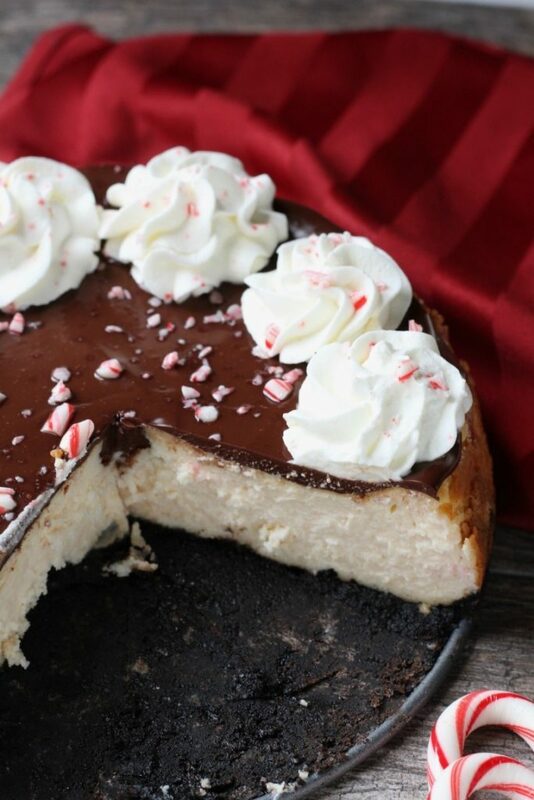 The chocolate cookie crust, peppermint mint cheesecake layer and chocolate ganache spread on top make one classy dessert. 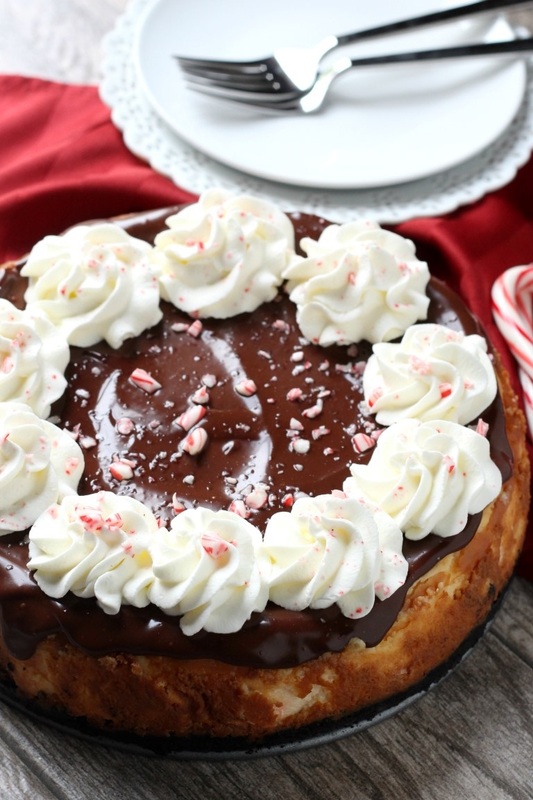 A thick, creamy peppermint cheesecake topped with dark chocolate ganache and whipped cream. Preheat the oven to 325 F. Stir the crushed Oreos and melted butter together. Press into the bottom of a 9 inch springform pan. In a large bowl beat together the cream cheese and sugar until smooth. Beat in the melted white chocolate, crushed peppermints, peppermint extract and sour cream. Add the eggs, one at a time, beating just until combined after each addition. Pour the batter on top of the crust in the spring form pan and bake for 55 to 60 minutes or until center is just set. Turn off the oven and let cool inside the oven for an hour. Remove and cool completely. To make the ganache, chop the chocolate and place in a heat proof bowl. Heat the cream in a saucepan over low heat until hot. do not boil. Pour the cream over the chocolate and whisk until smooth. 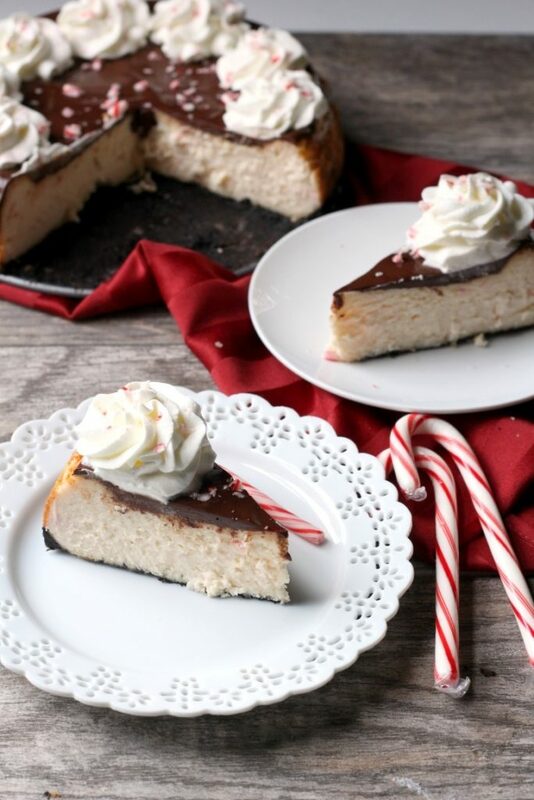 Cool and pour of cheesecake. Add whipped cream and crushed candy canes right before serving. 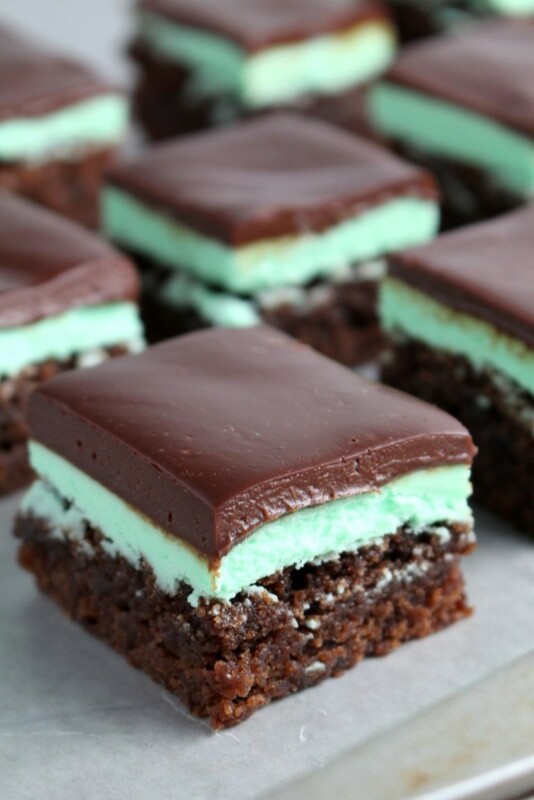 Looking for other chocolate peppermint ideas? Or how about a fun twist on classic cheesecake, Birthday Cake Cheesecake from Cookie Dough and Oven Mitt? 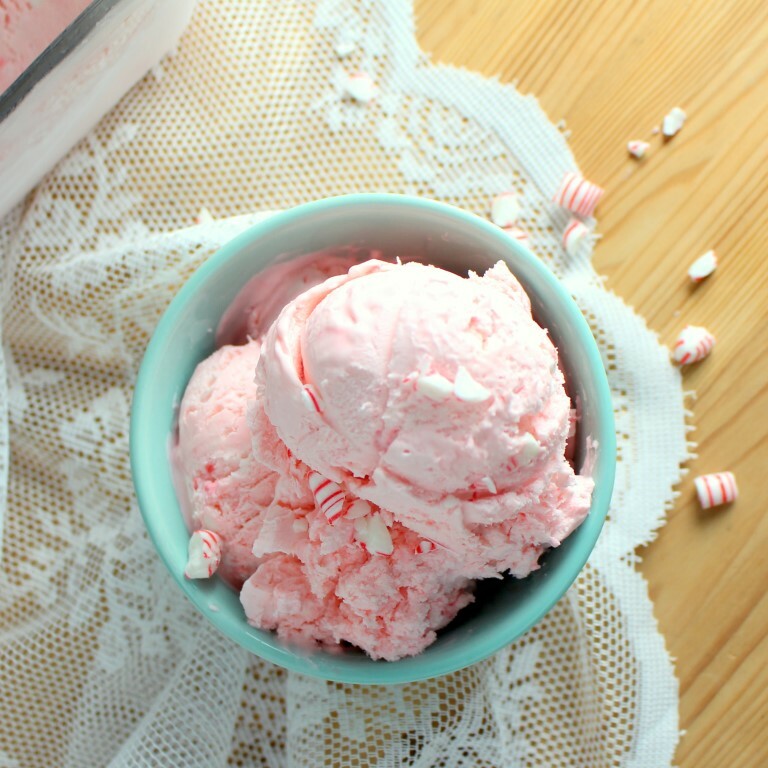 Here’s my No-Churn Peppermint Ice Cream for all you peppermint fanatics.